Coming into heads up play, Joseph Smith and Mike Zagorites were virtually even in chips. Rather than risk the $16,000 difference between 1st and 2nd, the two decided to chop the prize money evenly, both taking home $28,792. They ran out one hand for the title and the trophy, and Joseph Smith found a pair to capture 1st place. Congratulations to all of the players that cashed in this event. Tomorrow at 11am, a brand new $300 Mega Stack tournament will begin! Once again, Spiro Mitrokostas found himself in a massive coin flip against Joseph Smith, this time with [As][Th] vs. [6s][6h]. The board favored Joseph once again when it fell [4c][Qd][9d][4d][3s], and Spiro was eliminated in 3rd place for $14,160. 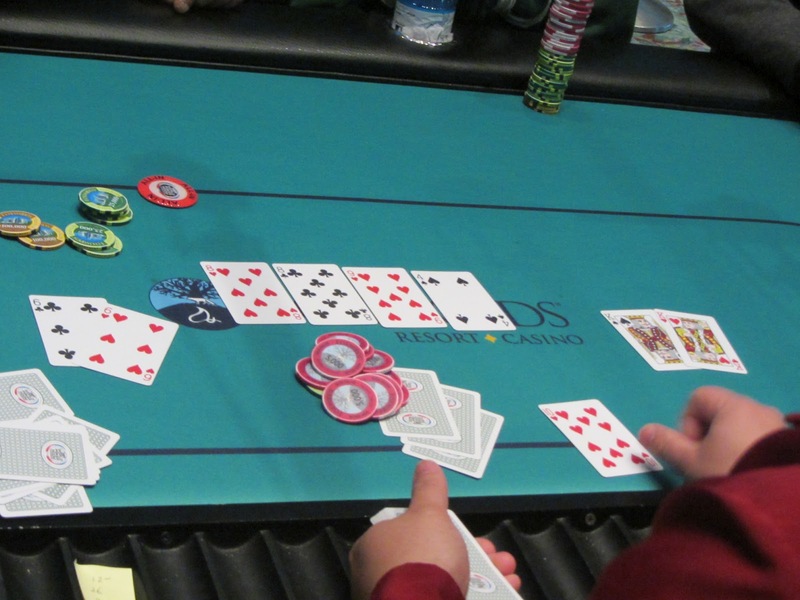 Phuong Nguyen was all in on a [3s][5c][6c] flop holding the [9h][6s], which was outkicked by Mike Zagorites's [Ks][6h]. When the turn and the river fell [As][Tc], Mike proudly proclaimed, "King plays," and pumped his fist in celebration. We are now down to the final three players. 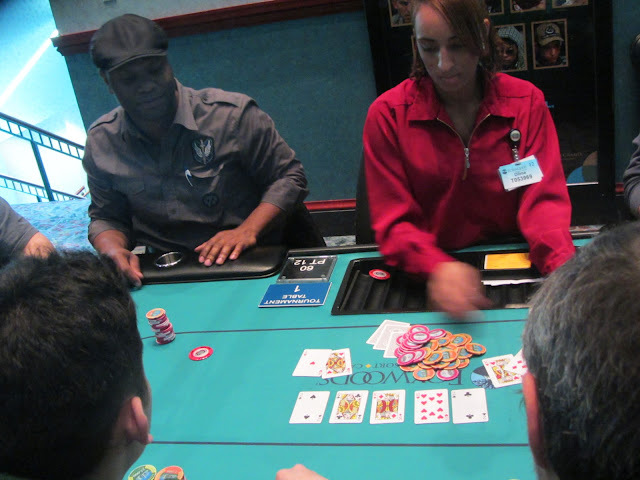 Just before the color up, we saw a slew of action at this 4 handed final table. In the first confrontation, Joseph Smith and Spiro Mitrokostas got all of their chips in with a massive coin flip. Joseph held the [Qc][Jc] against Spiro's [8s][8c]. Joseph made a straight on the river when the board ran out [Tc][6s][Kh][7s][9d]. Left with not even one big blind, Spiro put the rest of his chips in on the next hand and rivered a flush to quadruple up. He then called all in on the next hand, and found two pair with his [Td][7s] against the [Ah][5c] of Mike Zagorites. 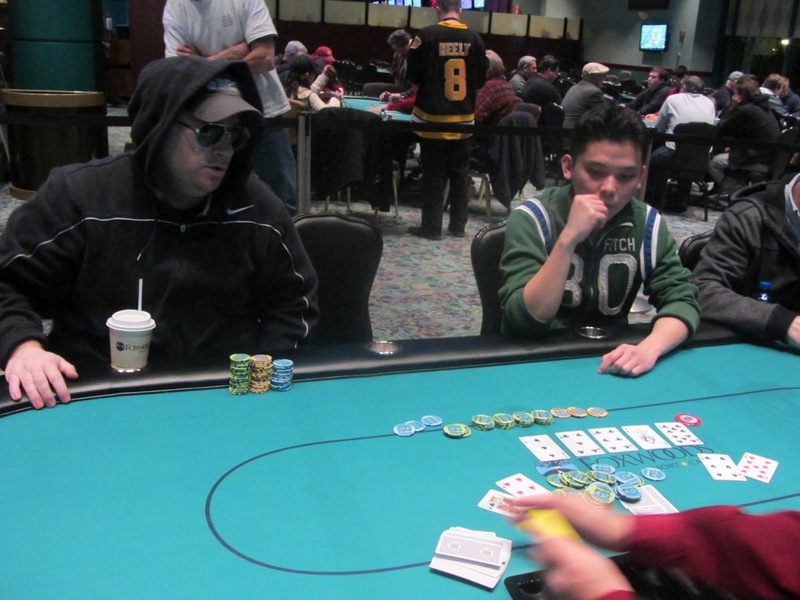 Phuong Nguyen had stayed quiet through all of this with his short stack, but he finally came alive when he pushed all in with [Ah][Qh] and was called by Mike, holding the [Kd][Jd]. Mike had Phuong on the ropes when the flop fell [2s][2c][Jh], but Phuong hit runner runner flush when the board ran out [9h][Kh]. The remaining four players are doing everything in their power to keep the tournament staff in place for at least the first bit of the Super Bowl. Spiro Mitrokostas started the action by raising under the gun. 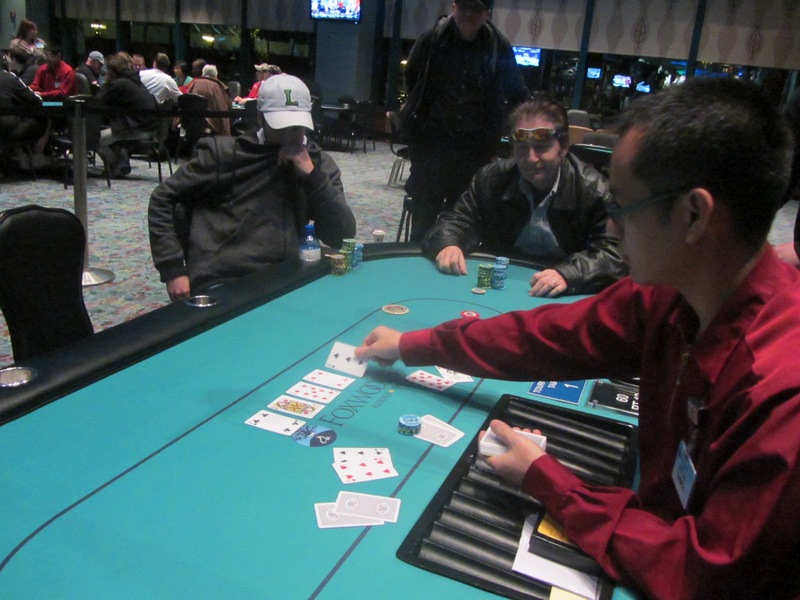 Mike Zagorites folded, and Phuong Nguyen called from the small blind. Then Joseph Smith moved all in from the big blind. Spiro elected to call all in, and Phuong made an agonizing laydown, finally flashing pocket nines. Spiro was in bad shape holding the [Js][Jc] against the [Ks][Kc] of Joseph. The flop was no help for Spiro, falling [Qs][2h][Ts], but the turn brought Spiro the [Jh] he needed. He needed to dodge a outs to a straight or a bigger set for Joseph, and he did just that when the river fell [4d]. 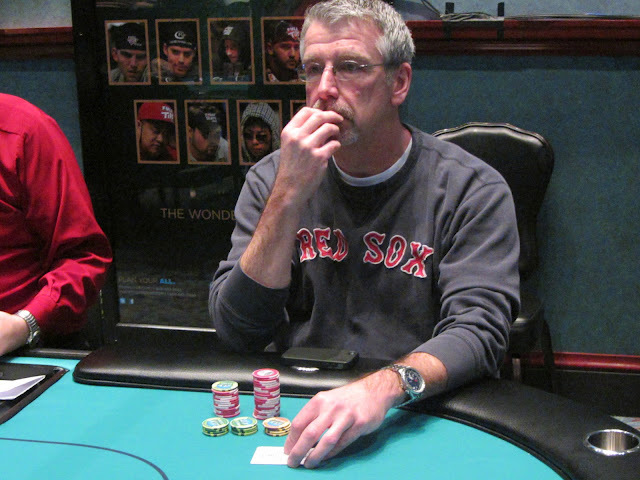 Jim Geoghegan opened the pot from the cutoff with an all in move and was called by Mike Zagorites. Jim had a good hand to move all in with, the [Ac][Ts], but Mike had him crushed with the [As][Qs]. 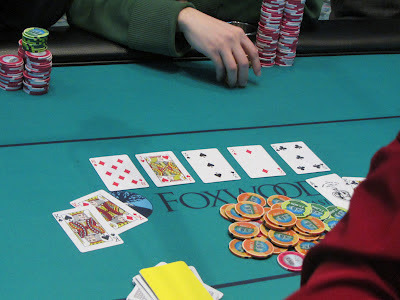 The flop of [3c][5s][2d] hinted at a chop, but the turn [Ah] and river [9d] failed to improve Jim's hand. He will exit in 5th place, good for $9,850. 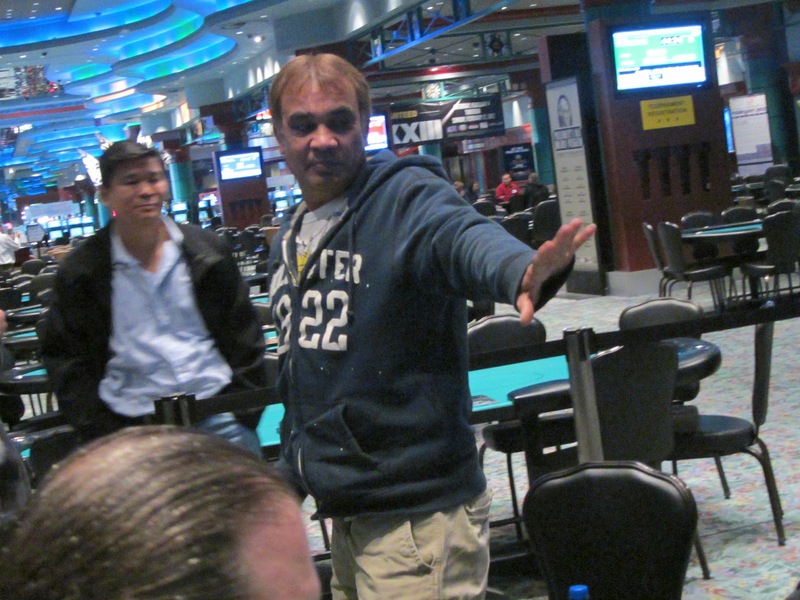 Raj Patel moved all in in early position for 305,000, and Mike Zagorites made the call. Everyone else folded, and Raj was slightly behind with his [Qd][Js], slightly trailing Mike's [Ad][8s]. When the board ran out [7s][Ah][Kd][2s][4h], Raj missed his straight and was eliminated in 6th place. He will collect $8,161, $1,000 more than the original 6th place payout before the deal. Final 6 each are $1,000 richer! 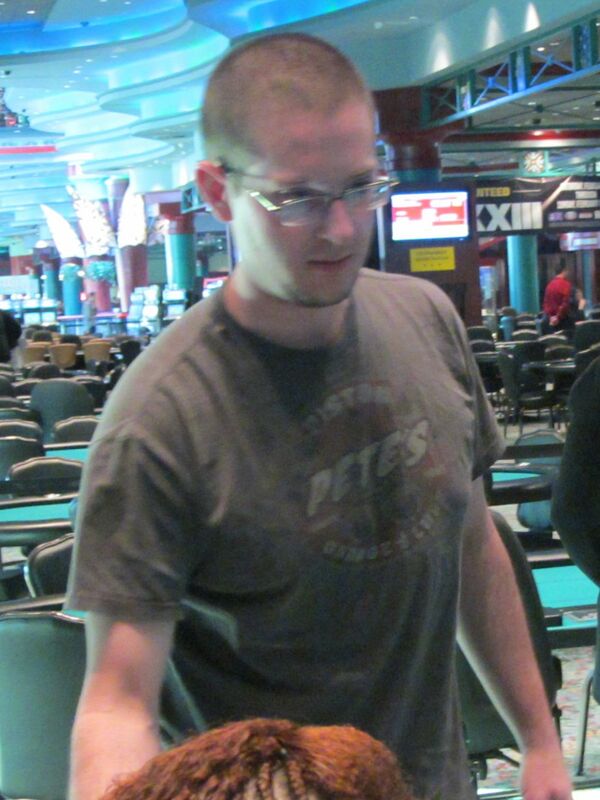 Marinko Matura was all in preflop holding the [6h][6c] against his opponent's [Ks][Kh]. His opponent's pocket kings held up through a board of [8h][8c][9h][4s][Th], and Marino was eliminated in 7th place, good for a $5,953 payday. Sam Granata was all in preflop holding the [7h][7d] but was dominated by Phuong Nguyen's [Qs][Qd]. The flop all but sealed Sam's fate when it fell [6s][3d][Qc], and the [9c] turn and [As] could not save him. Sam will exit this tournament in 8th place, good for a $4,828 payday. 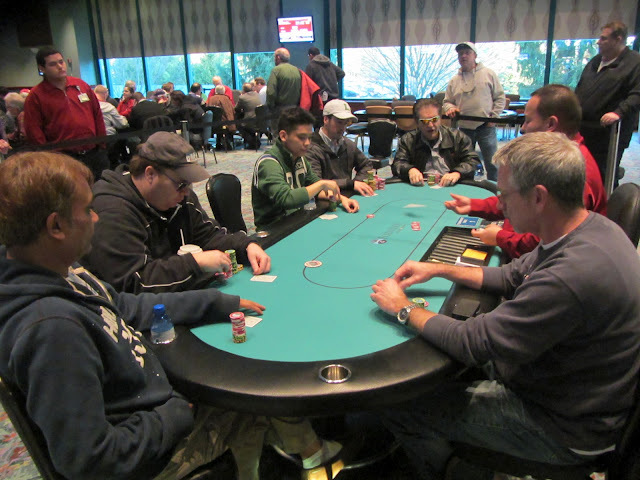 The final 8 players of this $600 Mega Stack tournament are now on break. 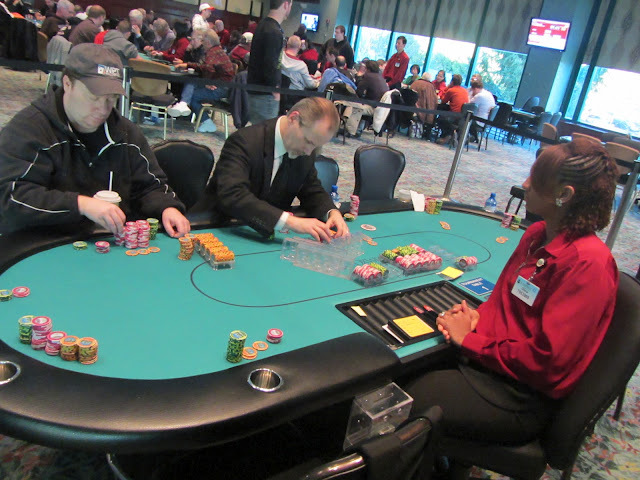 The tournament staff is now coloring up and racing off the 1,000 chips as they will no longer be needed. In the photo above, Mike Zagorites has stayed behind to watch the race. When the players return, they will be playing 15,000/30,000 blinds with a 5,000 ante. Bryan Barrile was all in preflop holding the [Ts][Tc] and was up against the larger stack of Mike Zagorites, who held two overs with [Ac][Kc]. Unfortunately for Bryan, the board ran out [Ah][Jc][Qh][Ad][9c] and Mike's three aces won the pot. Bryan will collect $3,951 for his 9th place finish. 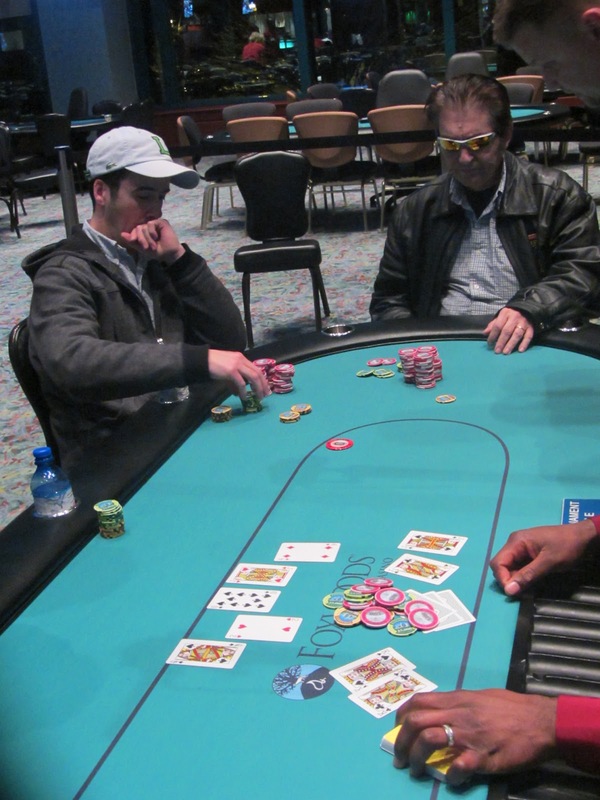 Rohan Long was all in preflop holding the [Ah][Qh] and was called by the [Kh][Td] of Mike Zagorites. 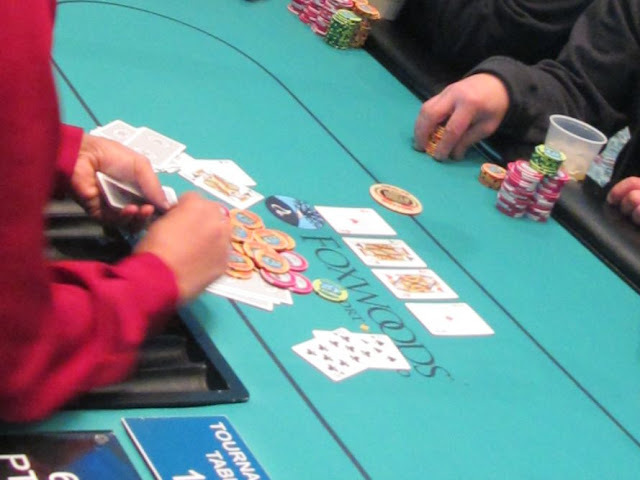 When the flop fell [2c][Th][Kd], Rohan was looking for a jack to make a straight or runner runner. The [Qc] gave Rohan a few additional outs, but the [2s] on the river sealed his fate. Rohan will exit this tournament in 10th place, good for a $2,735 payday. Spiro Mitrokostas was all in preflop with [Ks][Kd] against the [As][Kc] of Bryan Barrile. When the board ran out [8d][Jh][3s][2d][5c], Mitrokostas doubled his 749,000 chip stack and is now 2nd in chips. With the elimination of Luis Vasquez in 11th place, we have reached our official final table in the $600 Mega Stack tournament. Below are the seating assignments and chip counts for our final table. 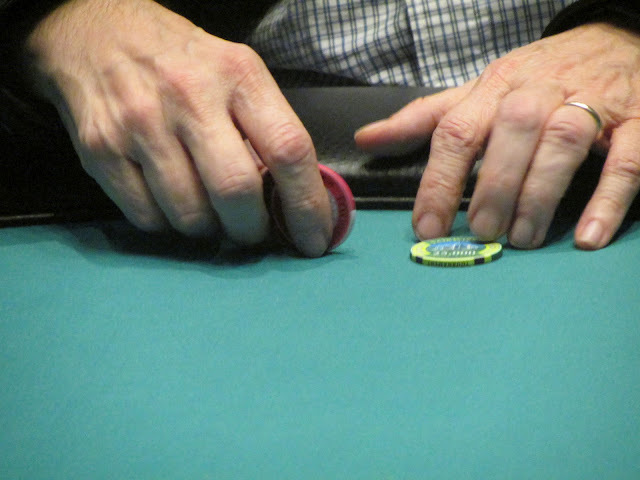 Play will resume after a brief break with 12:47 on the clock at the 10,000/20,000 blind level. There are 12 players remaining in the $600 Mega Stack tournament. The field has just returned from break, and they are now playing 10,000/20,000 blinds with a 3,000 ante. As soon as 2 more players bust, the remaining 10 will combine to form our official final table. Tune in to www.FoxwoodsLive.com to watch the live stream while waiting for the Big Game! The clock has just struck high noon, and the remaining 17 players have taken their seats, and cards are in the air! Our chip leader is Bryan Barrile with 915,000, good for 76 big blinds, while our short stack is Rohan Long with 93,000, or only 6 big blinds. With 15 minutes left on the clock, the tournament staff drew a card, and the players played that many more hands before stopping for the night. When the dust had settled, only 17 players remained from the starting field of 313. 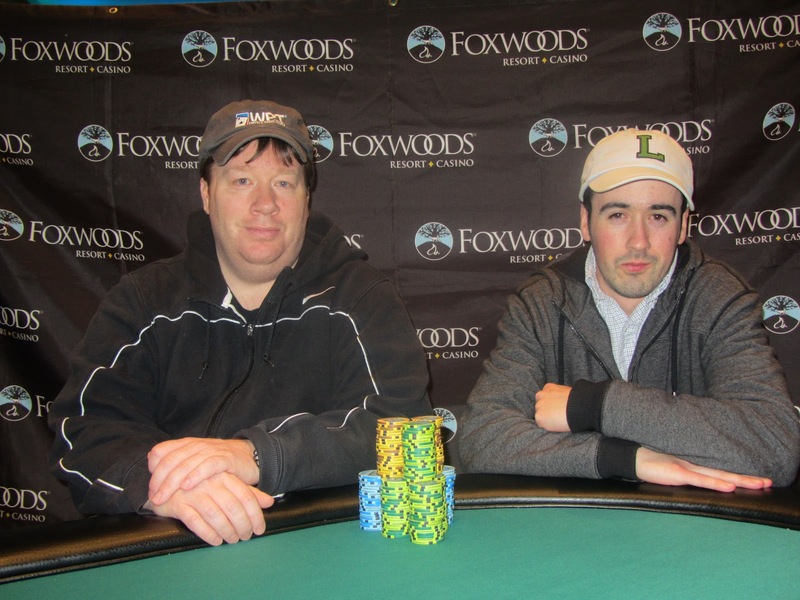 Everyone that remains is guaranteed at least $1,689, with 1st place taking home $38,378. Play restarts tomorrow at 12pm EST, and we will be streaming live on www.FoxwoodsLive.com until a winner is declared. Chips counts and seating assignments will be posted on www.FoxwoodsPoker.com shortly.